I've always thought of myself to be great at remembering directions and not needing a map. Ever. And then the day I updated my iPhone software, I needed to find my way around a never before explored area and felt completely lost. And when I opened my Maps, it looked rather blank. I kept waiting for it to load and then I realized it had fully loaded already. The new maps were as blank as my face gets when I don't find a joke funny. Apple had goofed up. There I said it. But I only admitted it now when they finally rectified this larger than life blunder. 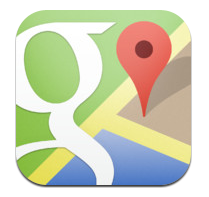 You can download the Google Maps App from the App Store now. Be a Man and never ask for directions again.